We are in the midst of a True Crime resurgence. Fueled by podcasts like My Favorite Murder, documentaries like The Staircase, and books like I’ll Be Gone in the Dark the genre is once again changing how we look at criminal investigations and the justice system. Still, the emphasis seems to be on the system that allowed criminals to go undiscovered during their “careers” or potential miscarriages of justice that need remedies. What about a clear case of murder though? Not just any murder, but filicide- a mother killing her children. 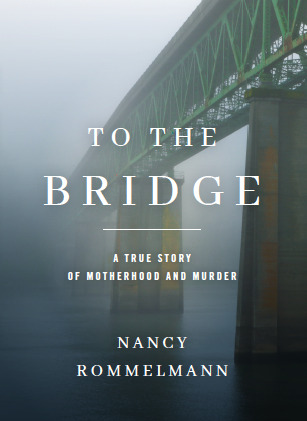 Is there actually more to the story of a mother who literally dropped her two children off a bridge resulting in the death of one and injury to the other? After sitting in on the arraignment of Amanda Stott-Smith, Nancy Rommelmann wondered just that. The result is a messy and tragic story of not very good to downright bad people coming together and falling apart. Rommelmann does not sugarcoat Stott-Smith’s actions and that is what makes To the Bridge stand out. Her upbringing in a conservative family makes her college aged rebellion and abandonment in early relationships- including a fiancee who killed himself- elicits some sympathy. At the same time, her selfish behavior, including leaving her child with friends for sometimes days without returning are not ignored or excused. She is never presented as anything but a deeply flawed woman. It is the exploration of Amanda Stott’s relationship with her now ex-husband Jason Smith that offers the most insight into her action that May night in 2009. Their volatile relationship gives Rommelmann the opportunity to dig deeper. She explores the toxic masculinity and gaslighting displayed by Smith and the effects of his manipulation on Stott. This discussion draws the reader into their twisted world and highlights the many failures that led to a child dying and a mother in prison. There are no heroes to champion in this one; the reader knows this from the beginning. What is offered though is a chance to understand the why and a real examination of how we hold killers accountable, but not always all those responsible. True crime readers or anyone interested in compelling nonfiction will find this an interesting read leaving them with a lot to think about long after they finish the book.